Not a moment goes by when you wouldn’t wish for your special angel to be by your side, right now. There aren’t many words that can capture your bond and how deeply you feel the love for your loved one, but there are some words that can make it easier to express. 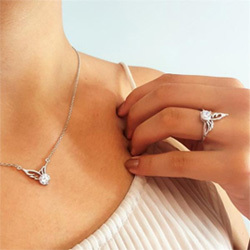 This absolutely gorgeous pendant carries loving words that are already written on your heart, “I loved you your whole life, I will miss you for the rest of mine,” as well as sparkling white stones that accentuate the heart and adorn the stunning angel wing, which is a highly symbolic part of the heart. This pendant is a precious expression of the boundless love that your heart will forever cherish. Love this so beautiful and well made! Such a great reminder for my mom that just passed away! This was a gift for a friend and she loves it! This was a gift for a friend. She loves it! Very pretty necklace..I will be giving it as a special gift..thank you! Very happy with my choice, thank you. As stated in last review I love this company. Will be ordering more items from them. I lost my daughter just four days before Christmas 2018 and this beautiful charm with perfect sentiment showed up somehow on my page. I knew I wanted it only because it said what my heart felt. It came today in the mail, and I cried because I miss my daughter so much yet I cried also because it's comforting to know someone somehow knew the same feeling and put into words and made this beautiful necklace. Thank you for capturing the thoughts of a mom's grieving heart. It’s a beautiful piece to go with the sentiment enscribed. It’s an eye catcher. Will order from you again.. I brought it for a beautiful young lady that I call my daughter. She lost her dear Mother in January. She is a classmate of my daughter's and has the the same birthday. Also her Dad was a classmate of mine. Breath taking quotation Love my necklace Lost my son 17 years ago Can never express the love I have lost.. This necklace says a lot of what I feel. The necklace is beautiful but I wish the The writing was just a tad larger and easier to read. But it is a beautiful necklace. Love my necklace, I got in remembrance of my mom who passed away on Oct. 13 2018 it seems to help in coming to terms of my mom being gone! Such an appropriate saying, comes right from the heart! Was a gift for a friend that has been missing her mother alot lately. She loved it. It's a beautiful piece. Showed up right on time. Looks beautiful and solid. Wish it would have come in a box as it's a gift but otherwise happy. Very pleased, beautifully made, highly complimented on it many times. Lots of compliments on it..very pretty..
Love the beautiful sayings that express how we who have lost our loved ones feel. The quality is very nice and nice prices also. It's beautiful! I bought this for my mom as a Christmas gift in remembrance of my dad who died 10 years ago on Dec. 26. I haven't given it to her yet but I know that she will love it. I bought this for my mom to celebrate my parent’s anniversary. She loved it as much as I did. I love that the chain can be adjusted. It is just beautiful and I would not hesitate to order again. Beautiful items to show how you feel about your loved ones that have passed. Love this reminder of my husband in Heaven with part of my heart there. I've been missing my daughter, who passed away3 years ago this month of October. The statement on this necklace had the perfect message that gives me peace. Thank you. Pat B.
I do like the heart I only wish it had a longer chain and also one that can be removed and put on another chain. That is the only thing I was disappointed in otherwise is very pretty. I'm in complete list of words had tears in my eyes when I received it. Thank you for the beautiful piece to wear in remembrance of my husband. Bought it for a friend that just lost her mom. She is going to love it. I bought this for my oldest daughter to wear on her wedding day. I just received my necklace so I haven't worn it yet but it's beautiful! Beautiful! It’s brilliance really stands out. I bought this as a gift for my mom, as we recently lost my baby brother. She loves it. I would recommend your company to others. I purchased this necklace after my daughter passed. I loved the inscription. I was pleasantly surprised by the quality of the necklace. I will make additional purchases. I love it and am wearing it all the time for my Daughter and Son that I lost..
Was very pleasantly surprised at the quality and design of this necklace. Will definitely be one of my favorites. I bought this and loved it so much that I bought another for my mother-in-law as she also has a child in heaven. We both love them! Fast delivery, courteous service, beautiful product - extremely pleased! This will go in a shadow box, but it us a bit heavier than I thought it would be. It is a wonderful piece and a great reminder of my husband. It makes me smile. I love this necklace I wear it everyday. Our Son passed away December 7th, this is helping. Very beautiful! I shortened the chain to wear it closer to my neck, and I love it. This was the first thing I purchased & I loved it so much & went back & ordered a bracelet too. Very, very pretty. I bought this for my sister who lost her daughter unexpectedly in October at the age of 40, when she received it she called me crying at how beautiful it was & how meaningful the words meant to her. Thank you. This necklace is beautiful. I lost my son at the age of 18 in a automobile accident and this necklace is how I feel. Perfect for me! I gave this necklace to my sister for Christmas. She lost her daughter this year to cancer and I thought she may like the necklace to wear. She loved it!! Thank you very much. Bought as a Christmas gift for a friend who's lost her only child. It conveyed the perfect thought and sentiment. She wore it the very next day and loved it. Ordered it in remberance of my daughter and my son. It's perfect. Last year my sister & nieces had gotten me a wing necklace & matching earrings for the same reason. Love that one also. Thank you so much. A beautiful memory, all who have seen it, loves it. The actual necklace had a much nicer look than the picture. Receive my Angel Wing Necklace. I will enjoy wearing it in memory of my son who passed away five months ago. More beautiful than I expected!! I love it!! Beautiful and gorgeous necklace. This is a gift for my daughter in laws mother. My daughter in law passed on Christmas Day 2017 from stage 4 breast cancer after being diagnosed only 30 days earlier. Perfect gift, beautiful necklace and the engraving is absolutely gorgeous!! Very well done, very well done!!! Love your jewelry. I purchased these for my daughters and granddaughters for Christmas. There brother pasted away in 04 and these are a perfect way to show how much he was love and remembered. Thank You for an item as special as these are. It is just beautiful, and the quality is exceptional. I just lost my husband and the words on your products are both comforting and healing. I bought this for my sister who lost her daughter to cancer last September. The words spoke to me knowing this was exactly how she felt. I didn’t tell her, and I had it mailed directly to her. She texted me the minute that she got it. She absolutely loved it and said the words brought tears to her eyes!!! Well worth my purchase!!! I absolutely love this necklace. It's message it just what I wanted. It came quickly and was easily tracked. Thank you so much. Love my necklace, get a lot of nice compliments. Thank you for such nice products and good service. Love it! Had some problems ordering it but am pleased with it. Your company was very nice and took care of it. This was my 2nd time to order. I will order again. Thank you! This is a gift for my daughter. I am sure she will dearly love it as I love my bracelet.